Blog › Building a NEW apartment block....in need of Multiple Mailboxes? Our secure apartment mailboxes are ideal if you are building or live and wish to recommend a mail delivery system, for student accommodation, private flats or even offices. Whether you require side door mailboxes, surface mounted mailboxes, recessed mailboxes, through the wall mailboxes or freestanding mailboxes, our multiple mailbox collection will supply the prefect option for you. With our vast size and style choices available, you'll be sure to find the right combination to suit your requirements and match the decor of your buildings interior or exterior. Each mailbox system will have different, yet similar features to ensure your mail remains safe and dry at all times. Small and large capacity apartment mailboxes are available, the majority of standard mailboxes hold A4 mail, with some designs including internal anti theft devices fitted behind each flap, name plates and much more, with additional features such as video cameras being integrated where necessary. So if you need easy access and safe and secure means of receiving mail, then look no further! 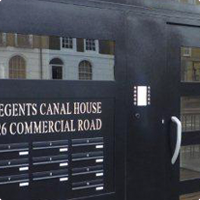 Our apartment mailboxes comply with British Standards and Royal Mail requirements, whilst saving space in any building.